Have you ever received advice from your doctor to “eat the rainbow”? I heard it from mine just recently! Of course they meant that we need to remember to include a variety of veggies and fruits in our meals to get all the needed vitamins and minerals. The idea here is that different phytochemicals in foods influence their color thus grouping various nutrients by color as well. For example, yellow foods like citrus and carrots are rich in vitamins C and A, while green produce like cabbage, kale, asparagus, avocado is high in vitamin K.
This bowl was built around the idea of mixing colors, textures, flavors, and most importantly, by not making any strict rules and instead listening to what my body was craving on this particular day. I let myself just be creative with my lunch and the ingredients I had on hand. 1. Thinly slice Brussels sprouts and cabbage. 2. Peel and cut grapefruit into segments. 3. 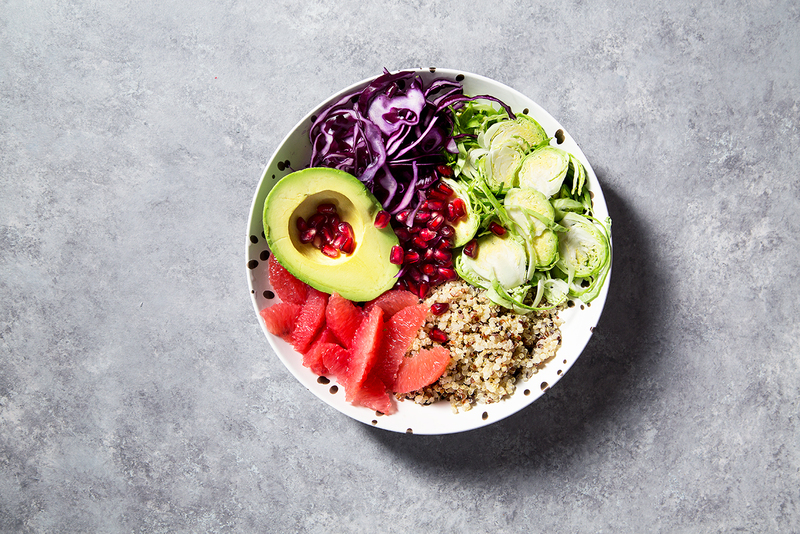 Add all the components to a bowl, drizzle with a dressing of your choice or just let the grapefruit and avocado play its role. Enjoy immediately!